Uniquely situated between nature park the Maasduinen and Germany lies this beautiful farmhouse from 1912, of which a part is converted into a modern holiday home. Very nice are some specific references to its origin. So is the ceiling of the living / dining room decorated with a cow pattern, and two bedrooms have a modern variant of the bedstead (very nice for kids). But modern comfort isn’t certainly not lacking here, for example all the bedrooms have a private bathroom. But how lovely the interior might be, the real highlight of this location is the beautiful nature. In front of the house lies a beautiful private natural pond where you even could swim by good weather The pond attracts special animals from the outline that you can spot here, like: the kingfisher, various owls, martens, stoats, swallows, and even the deer have discovered a drinking and resting place here. 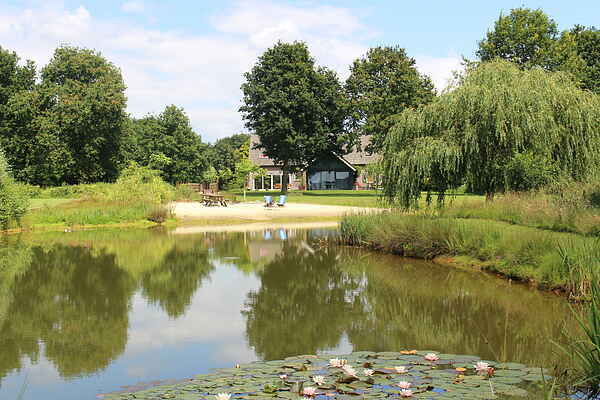 The Nature Park Maasduinen is very unique and offers opportunities for hiking and cycling. The homeowner can tell a lot about is. Another tip is the outdoor museum of Xanten, at just a half hour drive, you can relive the Roman times The refrigerator has no freezer compartment.